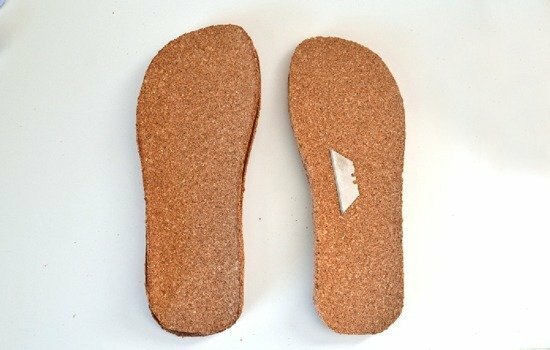 Today we;re going to make a pair of cork soles for homemade flip flops! I’ve wanted to actually physically make a pair of shoes for as long as I can remember. Not paint on a pair of existing shoes or Frankenstein a pair by taking parts here and there to make a new pair. But from materials that in no way, shape or form resembled shoes to begin with. So I’ve looked into the whole making shoes thing and it can be a lot of work. Seriously. I totally get why there are people who only make shoes for a living. It’s not easy stuff. So I sort of gave up on it. Then I was trying to make room in my crafting closet by transferring some of the less used stuff into the top part of my bedroom closet and I dropped a roll of cork left over from making these cork covered tables. As soon as I stepped on it. I quit moving stuff and started making a pair of flip flops in a huge mess of boxes and bags all strewn about. See that flip flop? It is one of the most awesome pair of flip flops I have ever owned. They are soft but they never get all compressed to where your heel feels like it’s making direct impact into the concrete. I got them at a pharmacy of all places. And then I lost one. I was pretty sure at the lake. But I couldn’t give up on them so I saved the lone right flip flop. So, I decided to mimic the shape and style of this flip flop, even though it’s not leaps and bounds different from any other pair. You’ll need 3 for each flip flop. 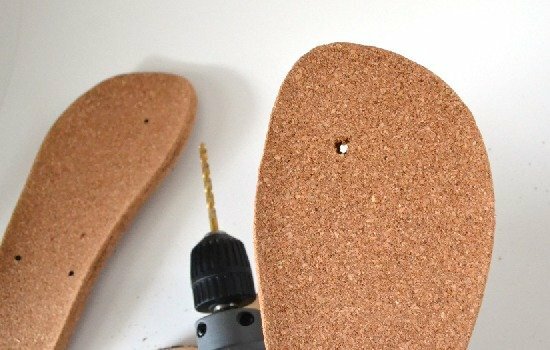 Make sure to go WITH the roll of the cork for each shoe, or so that each cut out curves kind of upward. When finished, your flip flops will curl up around your feet and it makes them quite comfy! After you trace them all you’ll need to cut them all. Go just outside of your traced line so that they are a bit bigger than your template pair. Use a pair of sharp scissors and snip decisively. Don’t drag the blades around because you’ll not get good results. 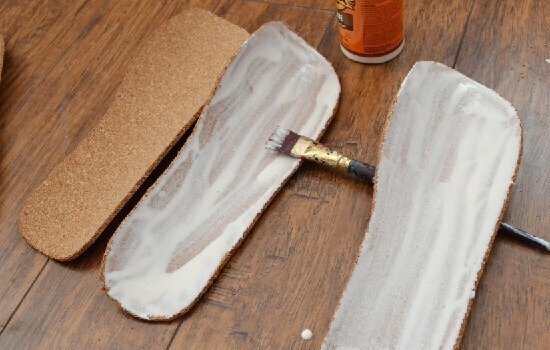 Slather on a TON of wood glue onto the top of two layers. Sandwich together your cork pieces, evening them up as much as possible. No two are going to be exactly the same but match up as well as you can. 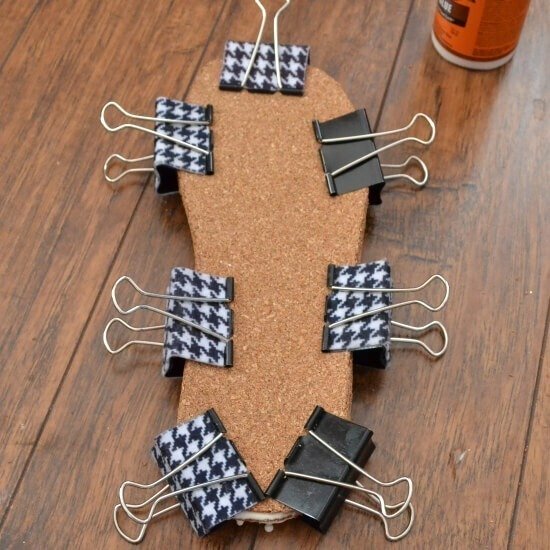 Take your binder clips or clamps and run them all around the edge of the flip flops. Some glue is going to squeeze out, so plan accordingly. Set to the side to allow to fully dry. Just to be safe, I gave mine 2 days. P.S. Like those sassy hounds tooth check clips up there? Make your own. Take your razor blade and trim up the outside of your flip flops. Now I’m sure you don’t need telling, but be very, very careful on this bit. Use a sawing motion and you’ll easy whip all around. All righty, righty. The shoe on the right has been trimmed up. The one on the left has not. See what a difference? Now also notice that the one on the right IS NOT PERFECT. Don’t sweat it. Here you can see them from another angle. Now we’re going to take care of that rough edge by taking a sanding block and gently working all the way around. I used a medium grit because it is what I had on hand and it worked really well. Please note that this is very, very messy. I only noticed after I’d done all of this in my office. Where my computer is. Smart! Now at this point I had magically found my other flip flop. What?! So I instead dug this flip flop which was also being saved out of my “I can’t make myself throw it away bin”. Somehow I got home from the store with only one purple flip flop. With the way that they tether those suckers together, I just knew that someone was playing a joke on me. But since that was 2 years ago, I decided to tear the straps out and use it as a template for where to place my new straps. Now, cutting the template shoe apart really isn’t necessary, just place it on top and peek up and mark down below. I just plain ol’ wasn’t thinking. Take your drill and drill holes in your soles. 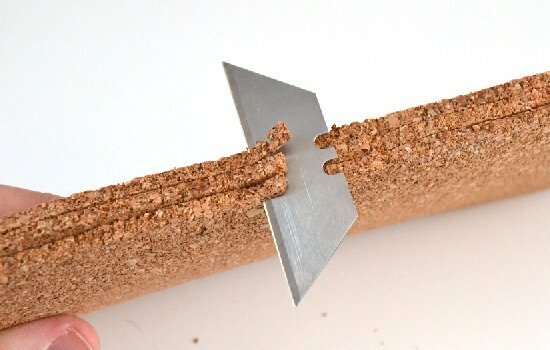 Now cork isn’t smooth like other woods, chunks are going to want to tear out, so go slowly and keep a steady hand. 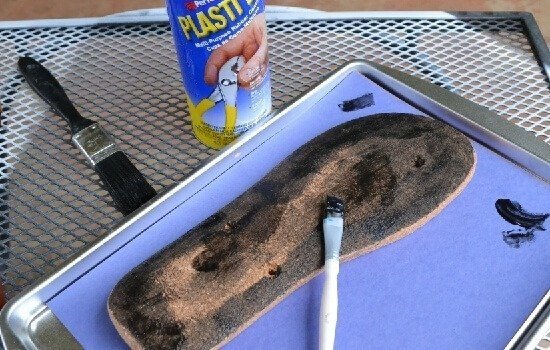 Now take an OLD brush and apply a thin layer of Plasti-Dip onto the backside of your flip flops. This is going to help our shoes from soaking up a tremendous amount of water if it’s rainy outside or whatnot. This stuff will gunk up your brush and it will be TRASH. So definitely don’t use one of your good Martha Stewart brushes like you see above. Allow the coat to dry and continue until you no longer see cork through, or when you have a nice, solid coat of the plasti-dip on the bottoms. This stuff has a nasty smell so be sure to do this outside or in a well ventilated area, please. 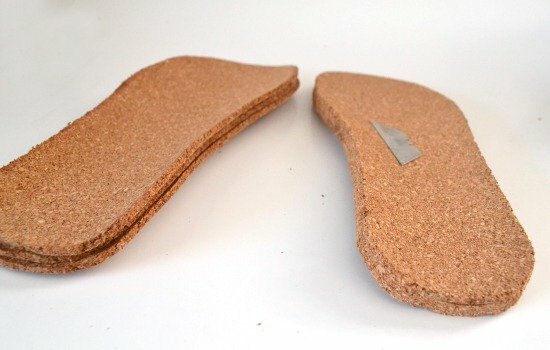 Well, since we’ve finished up our cork soles, that is the end, for now… So tomorrow I’ll show you how to make some fun straps to finish these babies up. Now, if you’re not inclined on the whole making the soles thing, that’s totally cool. You can buy some ready made flip flops from the store and modify them to have some new and awesome straps. See you tomorrow! This blows me away. You are so.freaking.crafty! I wouldn't know where to begin making shoes – like you said, it's a very involved process. But this tutorial is so easy to follow and so COOL! Definitely going to share this – the world must know! haha I am seriously amazed right now, Allison! p.s. I also think I love this so much because you are basically a shoe queen! It only makes sense that you make your own from scratch! You are a fearless crafter, Allison; that is just one of the many things I admire about you. Okay, I was guided here by the part 2 of the series, which is amazing but this tutorial blows me away even further! I have always thought that one without the knowledge of making shoes will never able to make one. This is crazy cool and the pair looks so doable!! Thank you very much for sharing this!! Great tutorial! I am so glad you liked it, Onel. Your enthusiasm is giving me a humongous smile right now. Where is Part 2 of 2 for this project? 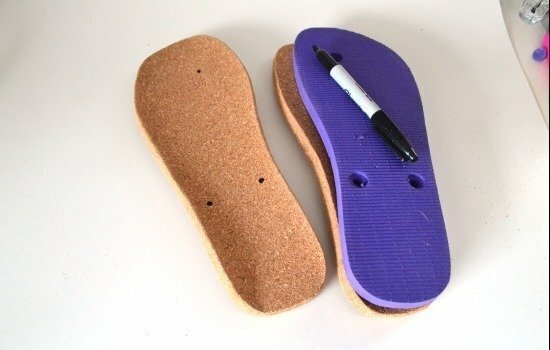 I've been wanting to make thick flip-flops, but NO HEEL… this is perfect! I just came across your tutorial by way of part 2. Genius!!! It’s been almost a year later. I’m dying to know how the soles held up. Were they comfy and did you get a lot of wear out of them? How did they hold up to rain and water? I live in flip flops and I really want to try this. I have a hard time finding flops that are comfy and wide enough for my monstrous size 10 feet which have widened even more after multiple pregnancies. Like you mentioned, I like my flops to be squishy but not compress so that there is just a thin layer between my foot and the pavement after wearing them a week. 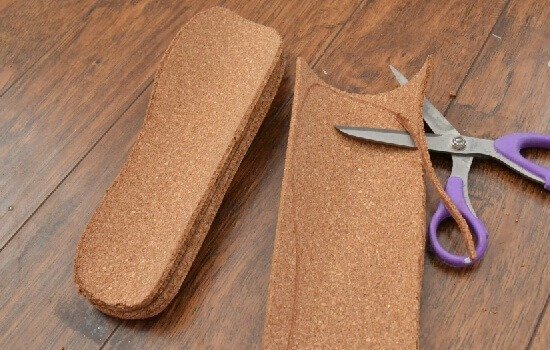 I’m also thinking that this would be great for making my own flats or sandals with the fabric straps glued between the layers of cork. Oh the ideas abound. Oh, I was also wondering how the traction was on them. Was the plasti dip grippy enough? I don’t really want to end up flat on my big ol’ backside. :) I was thinking maybe one could use that Flex Seal stuff for the bottom. First off the soles waaay outlasted my straps, but they were yarn and yarn stretches. Secondly, it was nice because after time they started to form to my feet. I haven’t seen them since the warmer weather but with new straps I think they could make another season easy. And I didn’t find any problems with the slip on the bottoms. Some of the cork-like texture came through the plasti-dip and I never had any problems in rain or whatever. The cork park DID soak up water if I was in heavy rain, though. Hi. I knit and felt wool yarn into slippers and clogs. People love them but when the bottom wears thin or wears through, I am left to knit an entire new pair. 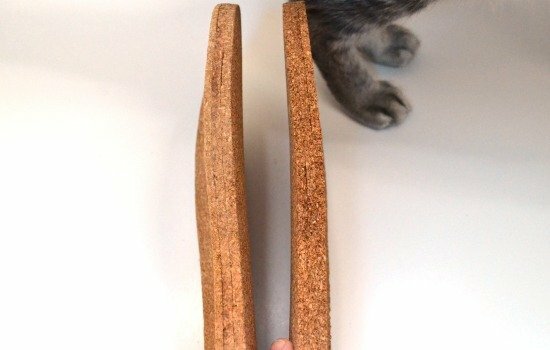 Do you think I would be able to cut a sole the size of the bottom of the slipper and just glue it on? I have 2 pairs ready to give as gifts and I’d really like to put a sole on the bottom so they last longer. THANK YOU! I think gluing it on could definitely work if you use a really strong adhesive! Thanks for the very detailed tutorial! Mind taking a look at what I make? They are called Sols Sandals: http://www.solssandals.com. I have that exact same pair of pink flip flops. I really loved wearing them. Problem is they’re too small for me now, and I can’t find another pair like them. I can’t bring myself to throw them away either. These are superb & could become part of my effort to crochet my own summer shoes!! ! !